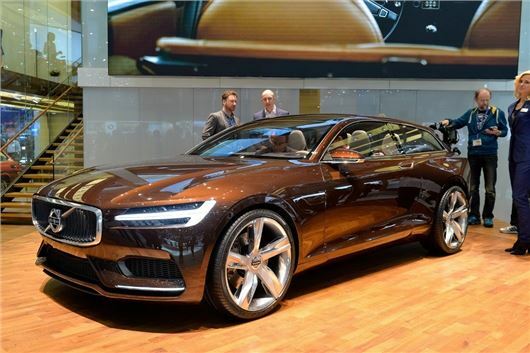 The Volvo Concept Estate had its public premiere at the Geneva Motor Show. It gives an insight into how the next generation V70 estate will look, although the production car will have five-doors rather than the concept's three. The three-door shooting brake estate is strikingly styled, with cues from old models like the P1800ES alongside modern touches like LED lighting and wide, muscular wheel arches. It's unclear just how much of the exterior design will make it into production Volvo models, but it has been confirmed that some interior details will appear in the new XC90, which is expected to debut at the Paris Motor Show in September. The cabin is dominated by a touchscreen embedded in the centre stack which controls almost all major functions and displays navigation. There is, however, still a traditional rotary volume dial and a few other physical buttons for things like the hazard warning lights. The touchscreen displays four ‘tiles,’ each with a specific function – navigation, media, telephone and climate. Volvo promises that the interface is so straightforward to use that it quickly becomes second nature, especially for those familiar with other tablet devices like iPads. The instrument binnacle uses an LCD display, with analogue style readouts framing a digital speedometer and gear indicator. Both the digital instruments and the large touchscreen control interface are to appear in next generation models starting with the upcoming XC90. Some elements of the interior are flights of fantasy, though, including the woven carpets, orange seatbelts and woollen headlining. Another concept car touch that you’ll miss out on in production Volvos is the equipment to play the Swedish stick-throwing game of Kubb, which is installed in the boot of the Concept Estate.